The Workforce Solutions Group is a robust statewide advocacy coalition playing a major role in setting the state’s agenda for skills training and workforce development. Formed in 2003 through a grant from SkillWorks:Partners for a Productive Workforce, the Workforce Solutions Group‘s work has led to significant advances in workforce development programs across the state. WSG has worked with over 30 agencies and 800 regional and statewide partners to consistently formulate and influence workforce development and economic development policy. 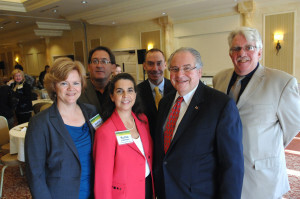 The Executive team of WSG is led by the Mass Business Roundtable, the MA AFL-CIO, Crittenton Women’s Union, the Mass Workforce Board Association, the Mass Workforce Professionals Association, and the Mass Communities Action Network. Kathie Mainzer serves as Project Director under the leadership of the E team. The Workforce Solutions Group convenes the annual Massachusetts Jobs and Workforce Summit, issues research reports on the labor economy, and advocates for post-secondary training and education in high demand industries. Through advocacy led by the Workforce Solutions Group, the state has added over $80 million in new workforce funding, including the creation of the Workforce Competitiveness Trust Fund, which has distributed $25 million in grants to support sector partnerships in every region of the state.